#4 – How will you work to ensure a safe, effective, and efficient transportation system in the city, ranging from biking and walking to transit options like AATA or the proposed commuter rails? Greden: I have long supported the City’s pedestrian transportation program, which adds new bike lanes and sidewalks as part of road re-construction projects. I also support the expansion of regional mass transit in partnership with SEMCOG, U-M, and other local governments. Kunselman: I can’t answer this question with much specificity as it is too broad of a topic, and much of our transportation planning occurs outside of City Hall. But I’ve always been supportive of pursuing a “safe, effective, and efficient transportation system.” As the candidate that is the most multi-modal of any (I have been known to bike, catch a bus, travel by train, drive a car, ride a motorcycle, and skateboard to my destinations), I know all too well the importance of the need for good roads (potholes are known to have killed motorcyclists), defined bike lanes, and laws that permit skateboarding as a form of transportation. As for the commuter rails – WALLY is dead due to a lack of Livingston County cooperation and cost sharing. And resurrecting commuter rail to Detroit will entail a huge federal subsidy that is not likely to happen during any tenure that I may have on Council; I would rather the Feds at least subsidize the Stadium Bridge reconstruction. 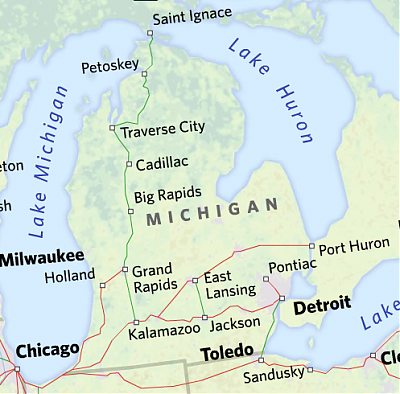 In the post on the “hydrogen superhighway,” Joel Batterman notes that the State of Michigan may cut funding to the Pere Marquette and Blue Water trains. The Pere Marquette has service between Grand Rapids and Chicago; the Blue Water, between Port Huron and Chicago. Here’s a PDF with information on the planned shutdown and what you can do about it. The Michigan Association of Railroad Passengers has more information. In other news, I emailed Amtrak asking for information on any improvements in progress or planned for the Wolverine line. No response, and there’s nothing of interested on the stimulus plan bids page. Finally, Wolverine’s service hours change starting today — some trains are earlier, others later, and some are unchanged. 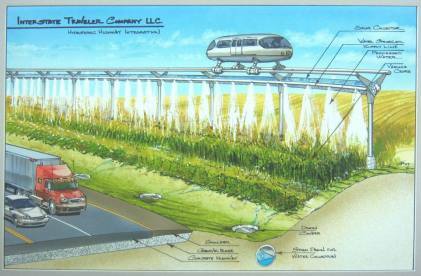 Every few years, Brighton-based Interstate Traveler Company pops up briefly with their visions of solar-generated hydrogen-powered mag-lev high-speed rail pods that could carry everything from people to individual automobiles to freight, provide conduits for public utilities, revitalize the American steel industry, and even provide remedies for drought and famine, all through private investment expense. Usually, their appearances get no more than a single news article, but this time they seem to have found traction. On June 15, the company presented to a State task force, claiming they had $2B in private investment lined up to build a Lansing-Detroit line. They would require the State’s involvement only in providing permission to use highway right-of-ways for the system, which would be built on elevated tracks built in the medians of I-96, US-23, and I-94. The proposal will now get a public hearing locally on July 10, from 10am – noon, at the University of Michigan’s Palmer Commons. Later presentations are planned for Grand Rapids and Detroit, according to the A2News. There is going to be a Town Hall Meeting tonight (May 11) at 7m at Washtenaw Community College to focus on transportation projects. Pam Byrnes will host a town hall meeting with U.S. Reps. John Dingell (D-Michigan) and Mark Schauer (D-Michigan) to provide an update on local, state and federal transportation projects aimed at improving roads in Washtenaw County. The town hall will take place on Monday, May 11, at 7 p.m. at the Washtenaw Community College Morris Lawrence Building, located at 4800 E. Huron River Drive in Ann Arbor. In addition to the speakers above, Ron DeCook the Legislative Liaison for MDot will be talking about funding possibilities and Terri Blackmore of the Washtenaw Area Transportation Study will be discussion transportation needs in the county. The getDowntown Program is holding the 4th annual Commuter Challenge during the Month of May. The Challenge is a month-long online commuting-competition between Ann Arbor businesses (primarily downtown) to see who can walk, bike, bus, carpool, telecommute, etc. the most. The Goal of the Challenge is to encourage people who are thinking about trying a sustainable commute to actually do it. As of April 30th, 2009, 113 114 117 Organizations and about 1,200 Participants have signed up for the Challenge. Last year, 114 Organizations and 1,400 Participants competed. Organizations can still sign up for the Challenge throughout the month of May. Meet the Competition: Info on Competing Organizations. The Commuter Challenge: What’s the Point? At the City Council’s Tuesday meeting, the Council voted to approve the site plan for the new underground parking structure at Fifth Avenue (also known as the Library Lot). This structure will add 670 spaces and will cost about $55 million to construct. In an effort to facilitate some discussion about the recently approved underground parking structure, I’ve put together a list of pros and cons. This list is compiled from emails I have received, arguments I have heard, and comments at the Council Meeting, which I attended. Since the Ann Arbor Chronicle did a wonderful job capturing the comments at the City Council Meeting, I pulled a lot of these pros and cons from their recent article. The City of Ann Arbor recently posted a status report regarding the implementation of A2D2 parking and transportation recommendations. Zipcar: The DDA and getDowntown are working to bring 4 Zipcars to downtown Ann Arbor. My hope is that the contract is signed for this by the end of the year and we have cars on the ground within 1 to 2 months of that signed contract. Parking: There are now reserved spaces for carpools and vanpools in downtown parking structures and the DDA is working on plans for an underground parking structure on the Library Lot. Transit: Service hours for the Link were extended to 11pm. They don’t say this, but it should also be noted that a Night Ride Shuttle and a2Chelsea Express were also launched. Non-Motorized: The DDA has refurbished bike lockers downtown, added moped and motorcycle parking , and approved plans for the Fifth and Division improvements. Wayfinding: Wayfinding signage is underway downtown. Lead by Example: The City of Ann Arbor is working with getDowntown on a customized sustainable commuting program for City Employees.